I posted my first entry in this review series of The Sandman back in March of 2015. It began as a thing to do to fill one of my weekly blogging slots and a chance to spend some time thinking more deeply about one of my favorite comic series. I think I originally had this grand vision of somehow writing a comprehensive critique and commentary on The Sandman; the final product obviously falls short of that. I think in the early issues, when there was still a lot laid out ahead to consider and unravel for my readers, I was much more disciplined in my approach to the series. I tried to judge each issue on its individual merits and do some explication. I don’t have the encyclopedic knowledge of all the references Gaiman makes in his stories, so I couldn’t hope to offer a catalogue of those interesting tidbits, but I could try to tease out some thematic stuff. Literary criticism is the thing I went to school to learn to do, even if it’s not a skill that sees much use outside of my hobbies. Somewhere around the time I reached Season of Mists, I got into the habit of thinking about larger narrative arcs more than looking at the nitty gritty of each individual issue. Some of those middle entries seem to my recollection to lean a little too heavily on summary; I remember expressing constant frustration that there were so many issues in a row that didn’t offer even a miniature resolution to help frame what was happening thematically (it’s one of the biggest limitations I’ve noticed in doing criticism that being unable to discuss the events of a work in full, especially when you know them, makes it incredibly difficult to offer any perspective on a text’s meaning). In the later entries, I think I settled on discussing characters I found noteworthy specifically and eschewing other details that hadn’t caught my interest. There are some subplots, especially in the later Sandman trades, that I don’t think I even mentioned in my coverage. In the end, I’m not sure if this exercise is something that anyone else will find particularly enlightening. I don’t think my insights into The Sandman are especially earth shattering, but I’ve tried to come by them honestly. Neil Gaiman wrote a fantastically rich story with a lot of facets, kind of like the character he placed at its center. Dream is an oftentimes infuriating character, but he’s never not fascinating. The central question is whether he will “change or die” and even after reading through knowing the ending, it continues to be a wonderful, nuanced story. Still, stories eventually have to end. Like I already noted, it’s a big part of what makes meaning possible. 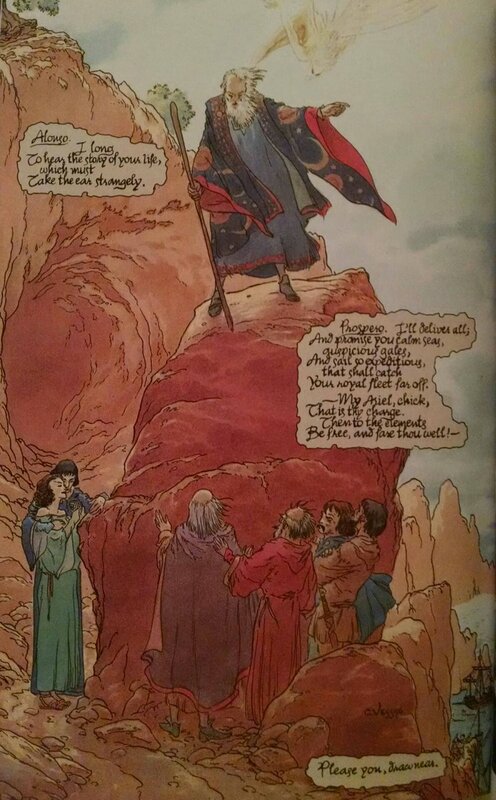 So the last issue of The Sandman concludes a story that Gaiman started way back in “Men of Good Fortune” about Dream’s dealings with William Shakespeare. The fact that this three part story even exists is a source of great joy, since it amounts to fanfiction about Shakespeare. As an English major who had a particular fondness for the English Renaissance, I get a kick out of these historical bits (courtiers during the Elizabethan and Jacobean eras of England’s history were involved in some really interesting intrigues). Shakespeare having a drink with Ben Jonson, who’s justifiably upset about Guy Fawkes Day (Jonson was a Catholic and a close friend of Fawkes, though his involvement in the Gunpowder Plot is uncertain; some scholars have speculated that Jonson’s play Volpone, meaning “the fox,” about a trickster mountebank was a covert method of mourning his friend’s execution; it makes sense when you remember that spelling rules were much more fluid than they are today) is endless entertainment for me. Stuff like the the obscure allusion to Shakespeare’s Dark Woman, who was one of the subjects of his sonnet cycle and a person that some speculate was a real woman whom he took as a mistress while he was in London, is exciting because it’s pop culture references: 1600s edition. All this is to say that when Gaiman starts discussing all this historical stuff about Jacobean England, I get excited because it’s stuff I recognize. The reason this issue focuses so heavily on Shakespeare is because it’s imagining a version of events surrounding his writing of The Tempest, his last solo work. One of the central figures in The Tempest is the old magician Prospero, whom most Shakespeare scholars agree is at least partly a stand-in for the playwright himself. Prospero’s extensive meditations on the direction his life’s taken and his resolve to leave behind his time as a magician runs strongly parallel to Shakespeare’s own career in the theater. Acting wasn’t a respectable profession since it was viewed as, essentially, professional lying; that the older male figure in his last play should give up his suspect powers to return to respectability easily matches with Shakespeare’s own experiences. The twist here is that Gaiman imagines a course of events where Shakespeare wrote his final play as the second half of payment he owed to Dream for unlocking his full artistic talent. Dream serves as a stand in for The Tempest‘s spirit Ariel, a creature who’s the source of much of Prospero’s power. The relationship isn’t exactly the same; Dream doesn’t present himself as a servant to Shakespeare but as more of a patron. What’s interesting here is the conversation Dream has with Shakespeare: Will wants to know why Dream commissioned this particular play (like most modern readers, Gaiman here assumes that the great stories are tragedies rather than comedies) with its facile ending that wraps everything up neatly for its characters. Dream’s response serves as a guide to his motivations for the entirety The Sandman. He believes he’ll never have the kind of story that Prospero has; for him there’s no escape from his life as king of a magical place outside the bounds of reality. Dream thinks that he can neither change nor possess a story of his own. The great irony is that we’ve just finished reading his story, and there’s plenty of evidence that he does change (I might argue that Dream’s dilemma between change and death is a false one; in many ways he manages to do both). Of course, most of the action of The Sandman is set nearly four hundred years in the future from the events of the final issue, and Dream isn’t omniscient. Still, we can pity Dream’s despair over his situation here and take comfort that he’s mistaken about his own fate. Beyond Shakespeare and Dream, there’s also the metanarrative at play in this last issue. Like I mentioned in my last entry, Gaiman is thinking about wrapping up his own long term project. We’re reflecting on this moment twenty years later when he’s had a long, successful career outside of The Sandman, but when the series was ending it was the most significant work he’d done. It’s easy to see Gaiman feeling some kinship with his subjects here. As for what’s next in this space, I’m still thinking about what I might do. There remains the collection of graphic short stories Endless Nights and the more recent Sandman: Overture within the Sandman mythos, but they’re so removed in time from the series proper (and I’ve been looking at that regularly for eighteen months now) that a break before tackling them is probably in order (besides that, the content of Endless Nights varies significantly in quality, and it was only ever published as a collected work, so I need to consider how I want to approach it as a text; Sandman: Overture is extremely good all the way through, but I don’t yet feel familiar enough with it to do an in depth analysis). I think I’d like to continue reserving this space for comics analysis, but I’ll probably tackle a much shorter complete series next; after that, we’ll see. If you like Shakespeare fanfiction, check out Ruled Britannia by Harry Turtledove if you haven’t already. An alternate timeline where the Spanish Armada worked and Shakespeare is a successful playwright in Catholic Spanish-occupied England. Of course, there is an underground resistance who want him to write a play to inflame nationalism. And an occupation government that wants a play to glorify Phillip II after his imminent death. Though there is the upside that he gets to hang out with Lope De Vega.